When it comes to shopping for countertops, most homeowners want to know which is better – Quartz or Granite. Unfortunately, there is not a clear-cut answer. Below is a list of considerations to help try and settle this debate. Being that granite is a natural material quarried from the Earth, the assortment of colors and styles is nearly limitless. The stone selected is unique to the home. No two consumers will ever have the exact same countertop. On the other hand, since quartz is an engineered stone, the variety of colors and styles to choose from is slightly more selective. 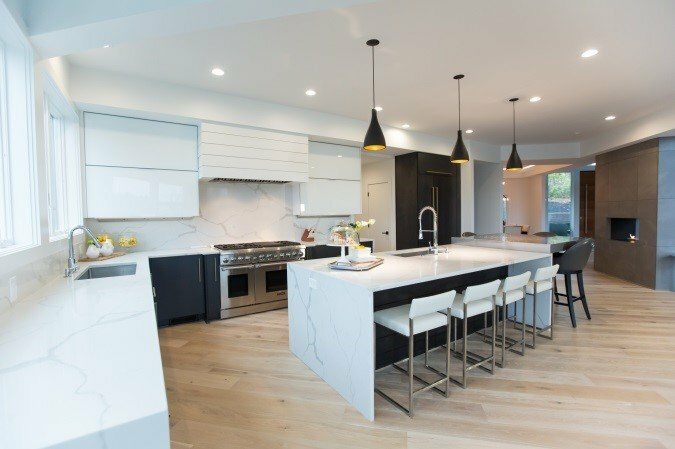 Quartz manufacturers have developed three major styles of countertops – solid colors, fleck or speckled looks, and veining & high-motion slabs. These major styles are what have proven to be most popular nowadays. 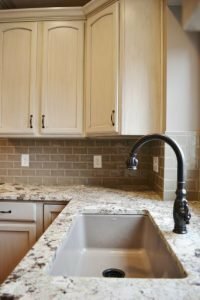 While granite is considered to be the most durable natural stone on the market, it is still susceptible to fissures and pits.. Provided that these imperfections are small, they can be spot repaired with epoxy. Granite is also vulnerable to staining due to its natural porosity. Routine sealing is needed to help reduce the risk of this happening. 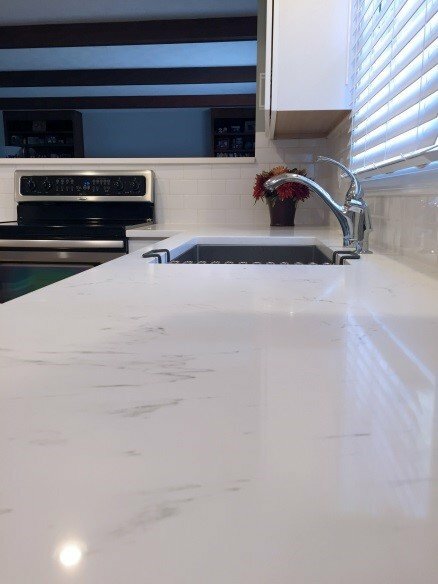 With its make-up of approximately 90% natural quartz and 10% epoxy resin, quartz ranks slightly higher on the hardness scale making it slightly more durable than granite. 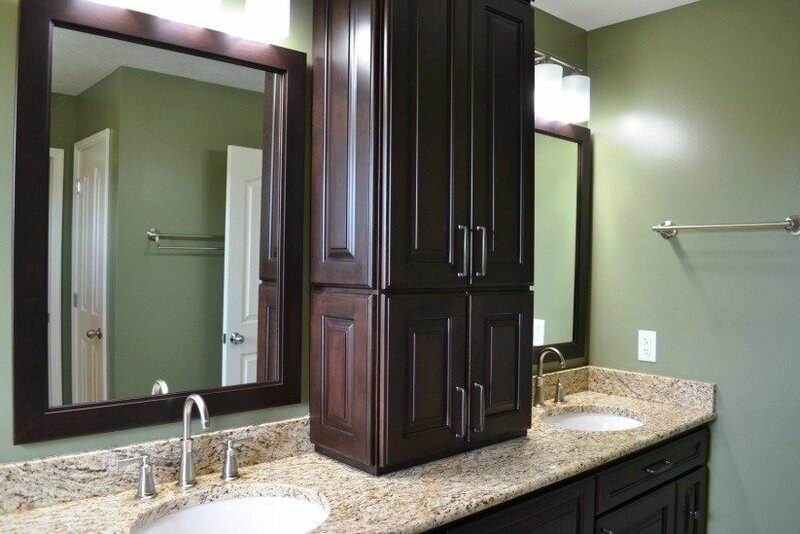 Additionally, this manmade stone is non-porous so staining is never a constant worry. For this reason, quartz is very low maintenance and does not require sealing. While granite starts at a lower price point that quartz, there is a very large price range associated with natural stone. That said, in generally granite tends to be bit friendlier on the pocket book. The manufacturing and transportation processes for both granite and quartz are very labor intensive requiring large amounts of energy. While proven to be safe in the home, in some instances small amounts of Radon are found in some granite slabs. Some quartz companies use recycled content to make up their products and in general are known to leave a smaller carbon footprint than granite. That said, small amounts of VOC’s (Volatile Organic Compounds) are known to be in quartz. So, which is best? 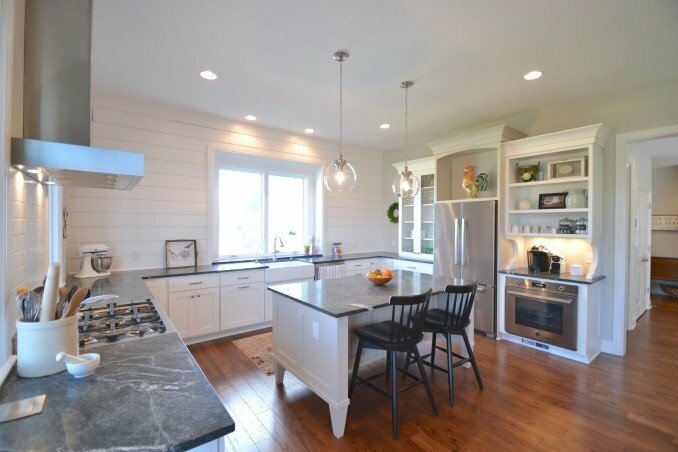 The Answer: Granite and Quartz are both great options! Choose which one is most visually appealing and fits within your lifestyle and budget. 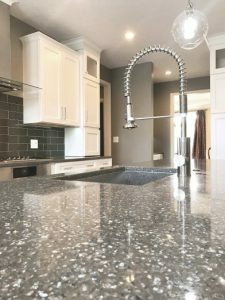 To see samples of both quartz and granite and to learn more about the general characteristics of each of these stones, please call us today @ 317.575.9540 to set up an appointment with one of our knowledgeable designers.